This year we decided to stay at home and have a celebration for two. We usually spend it with friends, but I have been a little under the weather and staying in sounded good. The hottest fashion trend this year has been to combine your dressy with your casual, so it only seems perfect to do that with our stay at home celebration. You can shop my outfit by clicking the picture above or on the Liketoknowit app. The Skirt is only $18 and the shoes are on sale for $58 and are super comfortable. We will dine outside on the porch (with heaters) so I thought this sweater would be perfect. I decided to serve Whit’s Chicken Enchiladas, Market Street Corn, and a Key Lime Pie. 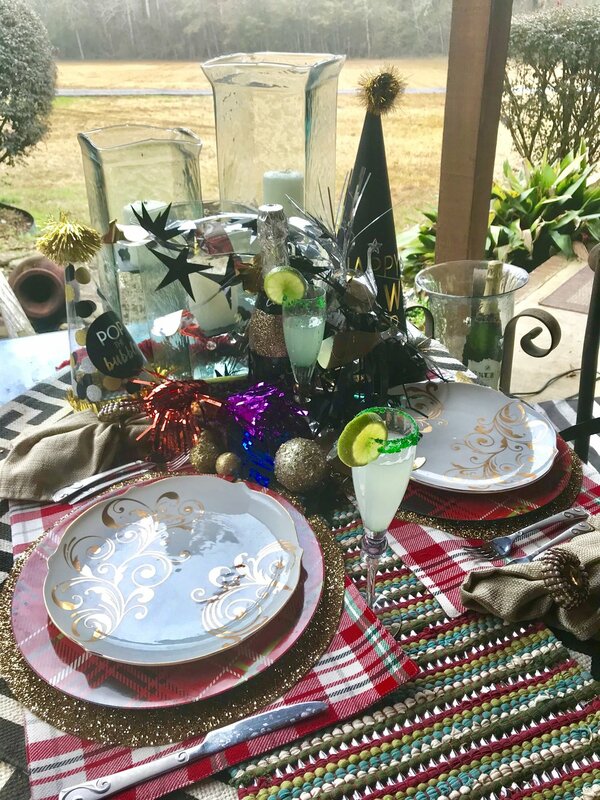 Those recipes can be found on my Southern Shine 2017 Pinterest page under the New Year’s Eve page. The Champagne Margaritas seemed like the perfect cocktail for our little celebration ( see the recipe below). We have each written down our five favorite moments of 2018 and will share them with each other during dinner. This is always fun to compare, I am so thankful for you who has made this dream become a reality for me. Lets get ready to make this the best year ever.